Before starting the collection of eye tracking and other biometric measures simultaneously, also known as co-registration, it is necessary to ensure that the setup will allow the synchronization of the data streams for later analysis. There are two main types of co-registration setups. The first type uses only one software to record all data steams simultaneously. With this setup, the software ensures the synchronization of data streams and therefore the user does not need to take care of it. The possibility of using this type of setup will be mainly determined by the availability of a co-registration software to be compatible with the biometric and eye tracking systems that are going to be used. In the second type of setup there is one dedicated recording software for eye tracking data and a different one for the other biometric data. Since the recordings are done independently and usually with different computers, we need a method to ensure that the recordings will be accurately synchronized in time. In this article, we are going to focus on this second type of setup and the main method for ensuring a good timing synchronization between biometrics data: shared events. Shared events are triggers or events that were produced and registered, theoretically, at the same time by your eye tracking system and biometric system. These events will be used as known common points in time between your data streams and will allow their synchronization and analysis after the recording. What we mean by timing accuracy of the events is the ability of the setup to send and receive a shared event as close in time as possible in the eye tracking and the other biometric data streams. The timing accuracy needed will depend on your intended application and what biometric data you are recording together with eye tracking data. For instance, in the case of EEG, the timing accuracy to timestamp common events should be as high as possible, in the order of one to few milliseconds. This is mainly due to the high temporal resolution of EEG (brain responses are measured with millisecond accuracy). Eye movements, usually categorized as artifacts in the EEG data, are also measured with millisecond temporal resolution. 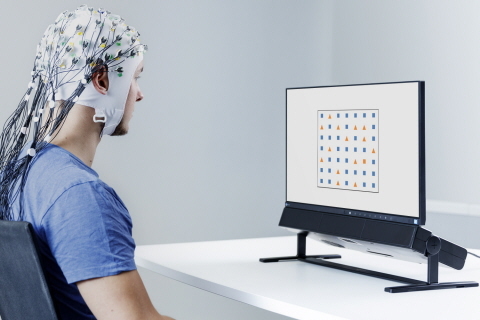 It is important to be able to align the eye tracking data and EEG data with high timing accuracy, so that the eye movements registered in the EEG and eye tracking data are perfectly aligned and the results derived from the synchronized data are correct. On the other hand, if we want to co-register Galvanic Skin Response (GSR) together with eye tracking, the timing accuracy of the shared events is not as crucial as in the case of EEG, mostly because of the high latency of the skin conductance response to an event (1 to 4 seconds). The timing accuracy of the events highly depends on the capability of your setup to send and timestamp them in both data streams with high timing accuracy. Tobii Pro recommends that you always check the event timing accuracy of the method you choose to send and timestamp your shared events. For example, by making a co-registration recording where you send events to all data streams at known intervals and then check the time distribution of those events. If you are interested in co-registering EEG, you can also use tools like the EYE-EEG plugin (EEGLAB), which will output information about the synchronization quality of your co-registration recording. A hardware device that sends events based on the information provided by a light sensor attached to the monitor (e.g. Stim Tracker). The hardware, this is, the eye tracker or the biometric amplifier. Transistor-Transistor-Logic (TTL) events. This type of event is known to be among the most reliable ways to send information with accurate time, especially if they are generated by a dedicated hardware. They are based on standardized electrical signals levels that are sent through the different pins of a TTL output port. TTL events are only able to send numeric events. Depending on the number of pins of the TTL output port and TTL input port, the number of different events that can be sent varies in a binary format (2 pins: up to 3 events, 8 pins: up to 255 events). An example of TTL events is to use the stimulus presentation and eye tracking recording data software Tobii Pro Lab to send TTL events and any biometric system with TTL input port to receive them. Network or TCP/IP events. These events are sent through a LAN network, so both the sender and the receiver are usually the recording software computers. In order to use this option, both the receiver and the sender need to share a common TCP/IP communication protocol. The advantage of using this type of events is that it is possible to send not only numerical information (as with TTL) but any type of string. This can be useful, for example, to include in the event more information about our experiment like the stimulus condition. A potential drawback of TCP/IP events is that the events are sent and received by computers, so there might be delays in the sending and timestamping of events (e.g. the synchronization errors of the biometric system and eye tracker clock with the computer clock, or delays introduced by network traffic). However, if the TCP/IP protocol is properly designed, the time accuracy achieved should be similar to the one obtained with TTL events. An example of TCP/IP events is to use E-Prime to present the stimulus, record eye tracking data, and communicate with NetStation (EGI EEG systems’ recording software) via the EGI own TCP/IP protocol, which is supported by E-Prime. Timing information to synchronize your data streams as already explained. Timing information about your stimulus (e.g. stimulus onset times). Experimental information about your stimulus. (e.g. assigning one code to each of your experimental conditions). This approach is quite useful if you want to analyze your data separately (eye tracking data in the eye tracking software and other biometric data in a dedicated software with appropriate biometric analysis tools) as both data streams will contain all the experimental information related with trial onset times. Learn how to configure Tobii Pro Lab to send TTL events to an external biometric device.